Movies, music, and booksignings aren't the only things we offer at the Jean Cocteau in Santa Fe. The theatre lobby also doubles as a small art gallery. Every month or so we mount another exhibition... of painting, photography, mixed media, what have you. As with our movies, we strive to be eclectic in the art we show. Up to now, we've displayed the work of local artists, some very talented painters and photographers based in Santa Fe and vicinity. 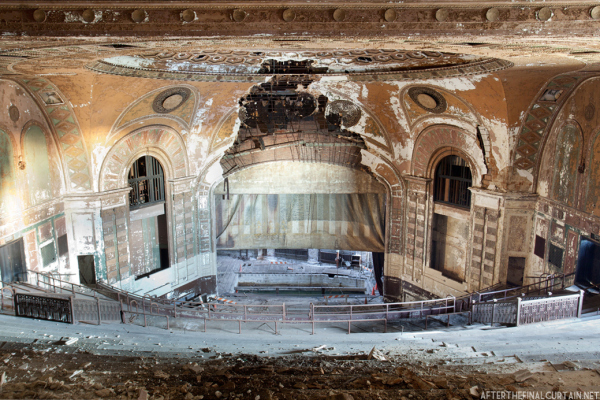 But next week we'll be offering something a little bit different -- a display of photographs by Matt Lambros, an amazing photographer from New York who has spent the last several years travelling around the country photographing abandoned and decaying theatres and movie palaces. The moment I saw Lambros's work, I knew I wanted to show it at the Jean Cocteau. What better venue, than the lobby of a theatre that has returned from the dead? I find Matt's photographs very powerful and very sad. These dream palaces had a brief heydey compared to the great cathedrals and castles of the middle ages, but they share the same sort of grandeur, even in decay. There's a strange beauty here. By rights, all these theatres should be haunted, and maybe they are... by the ghosts of all the kings and queens, heroes and villains, lovers and louts who strolled across these stages. I am really looking forward to hearing Matt Lambros, and seeing some of his work up close and in the original. The exhibition will run from tomorrow through March 17. If you get the chance, come see it. And if you're in town Monday night, join us for the lecture and slide show. They're still trying to keep the Uptown (enormous boarded up Chicago landmark, for out-of-towners) from rotting . . . The Uptown is a national treasure. A rotted and decayed national treasure, but still... 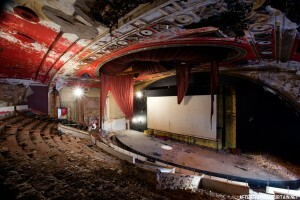 I used to see movies there, when I lived in Chicago, though by the 70s it was a grindhouse. Still, sitting in the vast auditorium surrounded by thousands of seats... there was something grand and glorious about it. You could buy all those old theatres and transform them into arthouse cinemas. 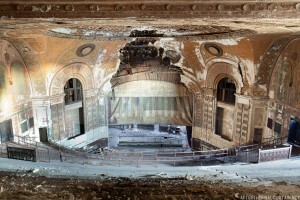 You could buy all those old theatres and transform them into arthouse cinemas with cool book shops and art galleries. And you could buy the surrounding land and because of the cool cinemas prices will rise and so you could slowly take over America and then abolish democracy and become king of America and rename it Westeros.